I recently had the opportunity to work with Scotch Colors and Patterns Duct Tape. I jumped right on it because I love working with unusual materials to create fun products and to stretch my creativity, and duct tape is one of those materials that challenges my imagination. Of course duct tape is great for jazzing up notebooks, accenting vase, frames, and making wearable accessories....and so much more! 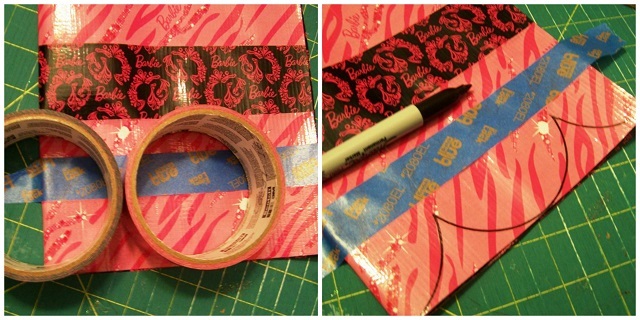 Using the Scotch Colors and Patterns Duct Tape in Glamtastic and Doll-lightful - oh how I love Barbie! 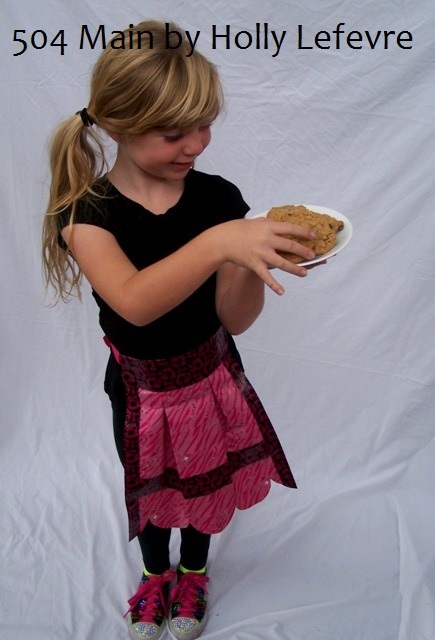 - I created a very simple apron that can be used for cooking or crafting. This version is for little kiddos...but it only take a few adjustments to make it big enough for an adult (yep, I see one in my future). Did I mention this craft is SUPER SIMPLE!? And super fun! Create a 17" x 17" square of duct tape fabric (these are approximate measurement - below you will see how many actual strips I used). You will cut it down later but I like to make sure I have a big enough square. Line up 8 pieces of Scotch Colors and Patterns Duct Tape in Doll-lightful vertically on the cutting mat, making sure the edges of each row of tape are touching. NOTE: I use the ScotchBlue Painter's Tape to ensure the pieces stay down and in place as I create the "fabric"
Once this side of the fabric is laid out, use the Scotch Colors and Patterns Duct Tape in Glamtastic and lay strips horizontally - you need 7 strips of Glamtastic and 1 strip of Doll-lightful (if you do the contrast stripe). When you have laid 5 rows of Glamtastic Duct tape, use the Doll-lightful duct tape and lay one strip, then continue with 2 strips of Glamtastic duct tape. Once you have finished your rectangle, measure with a L-square to create a "perfect" rectangle. Trim off the excess to create a clean rectangle. Then measure so that your rectangle is 15" Long x 14" wide when trimmed. 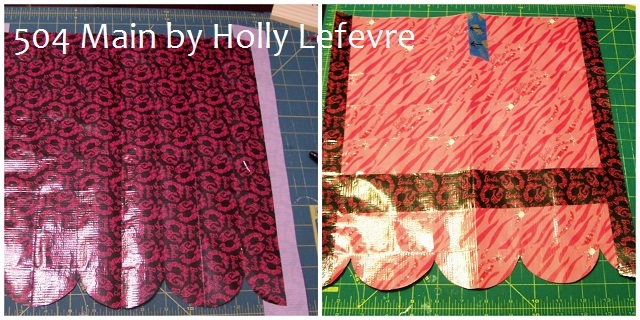 Fold the fabric in half lengthwise. Using the roll of duct tape, create scallops on the bottom of the apron - line up the rolls along the bottom edge and trace. Cut along your traced lines. 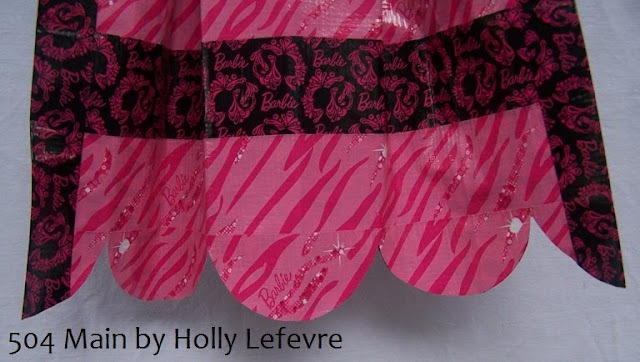 Finish your side edges by using a strip of Doll-lightful tape and taping half on one side of the fabric and folding it over to the other side and pressing down to adhere. (do this on both sides). Measure over 2" from the center point of the fabric, along the top edge. Fold the outside markings into the center marking to form a box pleat.- I use the ScotchBlue Painter's Tape to hold the pleat into place. The photo below shows my pleats held together with the ScotchBlue Painter's Tape and another piece of ScotchBlue Painter's Tape along the center fold. The waistband should measure approx. 10 "
Match the waistband to the apron. 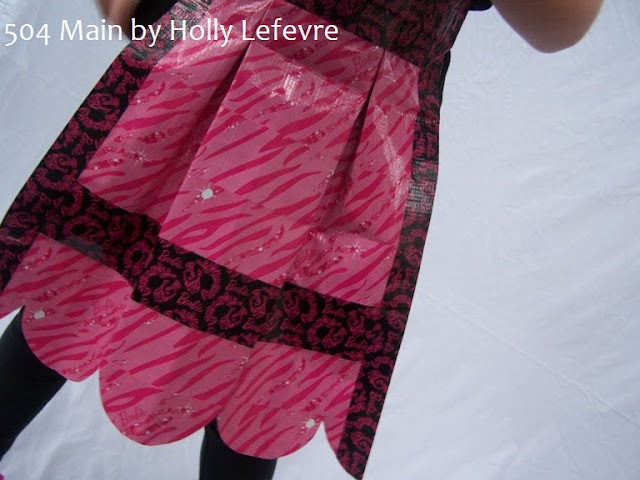 The 1" portion of the exposed duct tape will tape to the apron - match up the top of the ribbon to the top of the apron. Then fold over the remaining exposed duct tape to the other side and press down. Looking for some more Scotch Colors and Patterns Duct Tape? Have you created something with Duct Tape? This post is a collaboration with Scotch® Color & Pattern Duct Tape Brand. 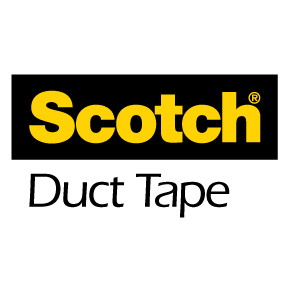 Join the community at https://www.facebook.com/ScotchDuctTape or visit http://scotchducttape.com/ to learn more. 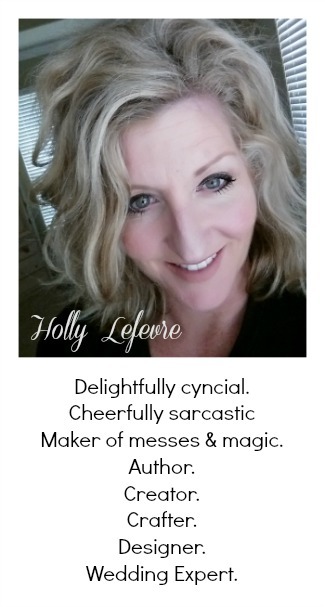 You are so creative, Holly! I would find it hard if I didn't have packing tape for my projects. I'll have to check out using duct tape to. What can I say tape is great.